This first Workshop instalment will identify all of the components and parts needed to put together an early-60s style Stratocaster pickguard assembly. It’s not all about the look; we’ll also discuss how certain parts have a noticeable effect on tone. Choose your guard carefully; there’s a world of difference between how close some of the vintage reproductions on the market appear when compared to a 1960s original. 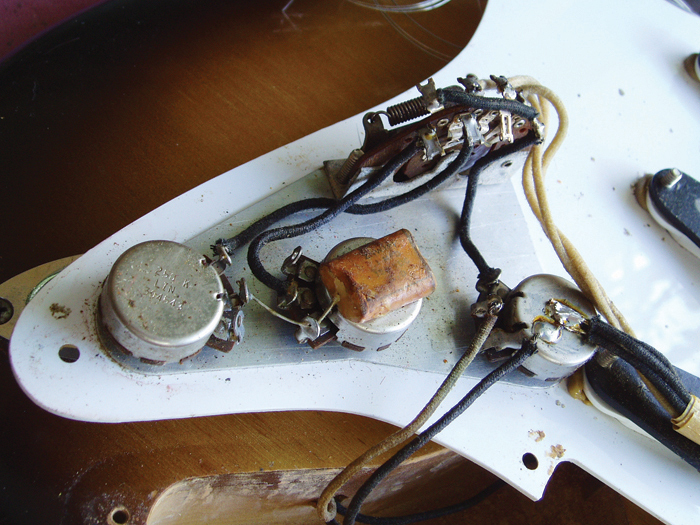 When you look under a Stratocaster scratchplate it can seem like a rat’s nest of wires. Older guitars will usually have been worked on several times over the years, and all too often you may see a mash-up of different parts with a mixture of plastic- and cloth-covered wiring. Very few vintage guitars have survived with the original wiring intact, but when you examine pictures of original examples, it’s obvious that Fender has always had a very precise way of doing things. This pickguard from a ’62 Strat has the original pickups, but the tone potentiometers and capacitor are from a later Strat. There’s a mix of original cloth- and plastic-covered wire. 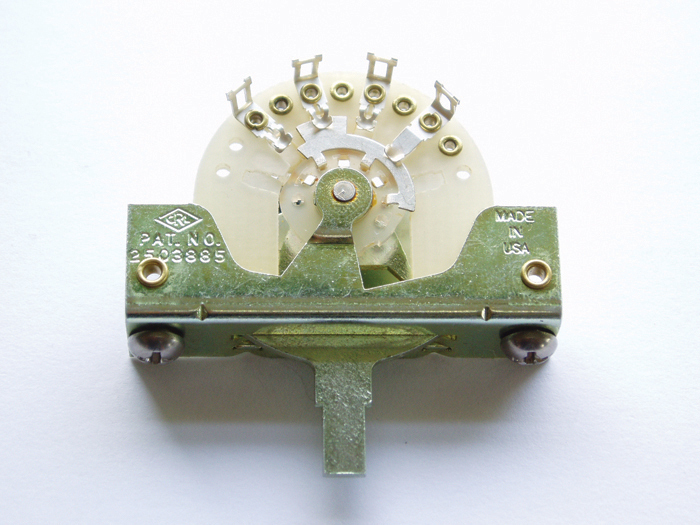 The switch is a very old five-way and a treble bleed cap has been soldered across the volume control. Many of us will need to wire up a Strat pickguard from time to time, whether it’s to restore an old guitar, upgrade a cheaper model or perhaps to create a full-on aged replica. In this first instalment of our pickguard project, I’ll be documenting the parts you will need to nail the looks as well as the sound of an early-60s Stratocaster. 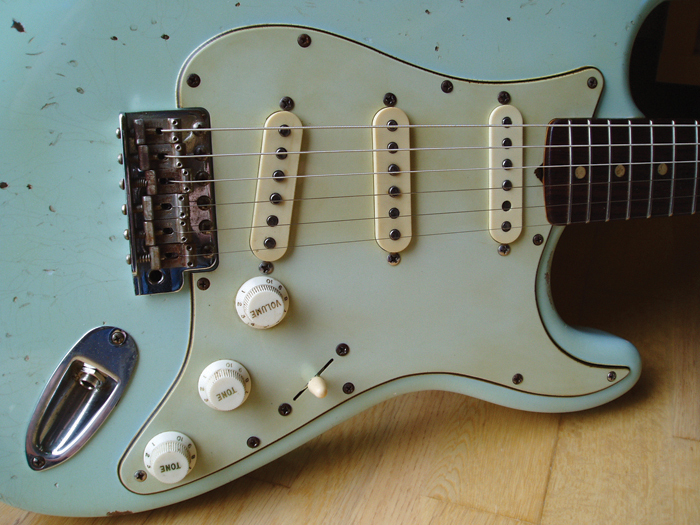 There’s a lot more to recreating 60s Strat tones than simply buying a set of boutique pickups. Understanding how these parts interact to affect the tone of a guitar will help you get the results you want and maybe even spare you from the merry-go-round of endless pickup swapping. There are always certain parts that are almost impossible to get right on aged or distressed guitars. Replicating the wear on maple fingerboards is notoriously difficult, as is simulating the verdigris effect on Gibson goldtops. 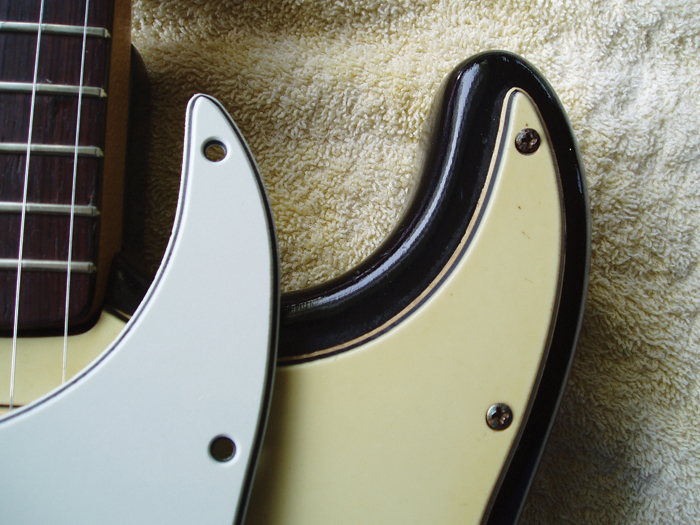 When it comes to 60s-style Strats, the pickguards invariably let them down. The changeover to rosewood fingerboards coincided with a new three-ply pickguard that was made from celluloid nitrate. This volatile material is prone to cracking and shrinking, as well as being highly combustible. So it’s understandable that Fender decided to stop using the stuff in the mid-60s, and it now doesn’t even use celluloid nitrate for the Custom Shop relics. It’s a shame, because the look of those original ‘green guards’ is quite unlike the PVC plastic replicas. Although some replicas can look decent enough, the deep sheen, translucency and colour of celluloid guards was utterly distinctive – especially with 50 years or more to develop a patina. White three-ply celluloid sheet is fairly easy to come by, and some have used it to make pickguards. Unfortunately, despite concerted efforts, it has been found that white celluloid does not turn green, no matter how much time it spends in the sun. With that in mind, I was interested to learn about a Canadian company called Groovy Guitars that sells green pickguards made from celluloid nitrate. At $99 (US), Groovy Guards are not a cheap option, but having said that, they’re made from the real thing and they don’t cost that much more than certain PVC replicas from Japan and Germany. This pickguard from Groovy Guitars in Canada is made from celluloid nitrate and the colour is intended to be identical to the way Fender’s guards looked when they were brand new. Here’s how it compares to a well-worn ’61 pickguard. The guards are not aged, but they are claimed to be the same shade that would have been seen on pre-CBS Stratocasters when they were brand new. I decided to take a chance and went out and got one for this project. Groovy Guards are cut beautifully and have a stiffer and weightier feel than PVC repros. At 0.1 inches, they’re the correct thickness – and they have the correct bevel angle, too. They’re also very accurately cut, lining up perfectly on two genuine pre-CBS bodies as well as bodies from Guitar Build and Allparts. So, what about the colour? Groovy Guitars claims that the colour matches the back of vintage pickguards as well as the areas under the control knobs – which can be very much lighter than the surrounding areas. I tested the claim against an original ’61 pickguard and I’m pleased to report that Groovy Guitars has it pretty much spot on. Comparing the colour of the Groovy Guitars guard with the area under the tone knob on the ’61 guard, we think it’s an excellent match. But the issue remains – do you want to wait 30 years for a celluloid pickguard to age naturally, or can the process be kickstarted? I decided to find out, and I was delighted with the way it turned out – but you will have to check back our next instalment in order to learn how to do it yourself. Most Strat players are prepared to put up with some noise because they prefer the tone of single-coil pickups to humbuckers. Even so, Fender used a small shielding plate through the 1950s, before moving over to a full-sized 14-gauge aluminium shield late in the decade, which lasted until 1967. Aluminium is regarded as a very effective material for providing protection against noise, but the aluminium shield also has an effect on the sound of Stratocasters. Apparently, this is due to ‘paramagnetism’, which softens and smoothes out edgier overtones in the upper midrange. In other words, a shielding plate can give your guitar a sweeter and more vintage tone. I have tried this for myself and found the effect of the shield is clearly audible. The midrange took on a rounder quality, with single notes producing a more vocal ‘ooh’ tone. Most players dive straight into pickup upgrades to achieve ‘vintage’ tone, but with aluminium shields being readily available for as little as £10, it’s something that’s surely worth trying first. 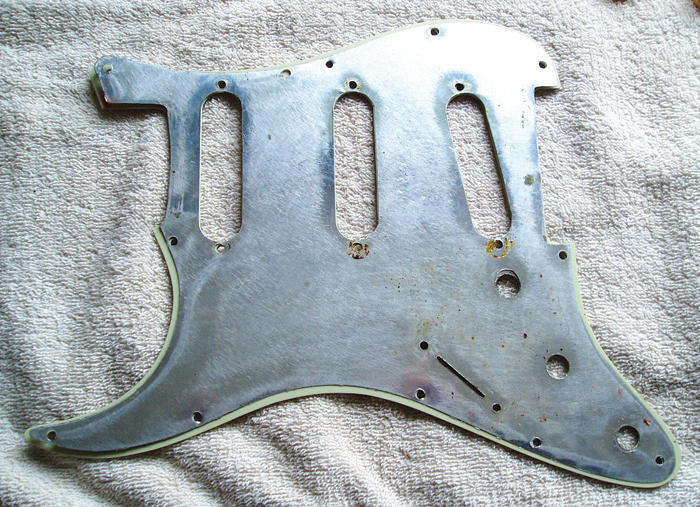 This is an original ’61 Fender shielding plate on the back of a pickguard awaiting reinstallation of pickups and controls during a restoration project. If you want to do this job properly, you’ll need to buy one. However, they are fairly inexpensive. 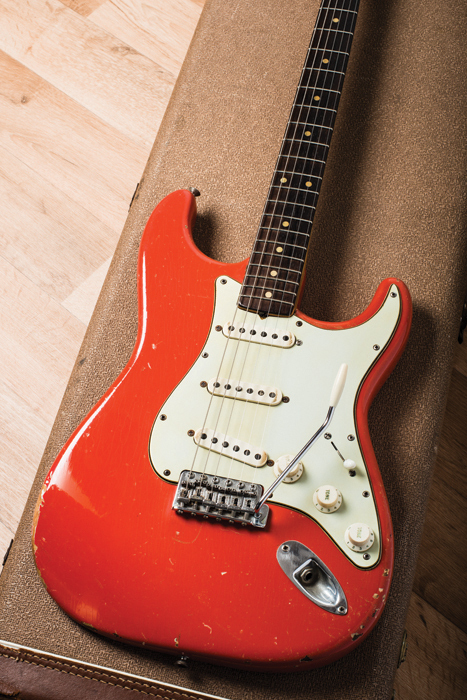 For early-60s style Strat controls, you’ll need three 250K potentiometers and a five-way switch – or a three-way switch if you want to be a purist. Most builders, including Fender, seem to use CTS-branded potentiometers, and Allparts UK offers a couple of options – one of which is described as ‘vintage style’. Some people prefer Bournes pots because they feel faster and smoother. These CTS 250K potentiometers are ideal for this project. They don’t look quite like those that Fender used in the early 60s, but they’re close enough. Audio (log) is the best option for the volume control, but opinions differ on the subject of tone pots, depending on the preferred response. 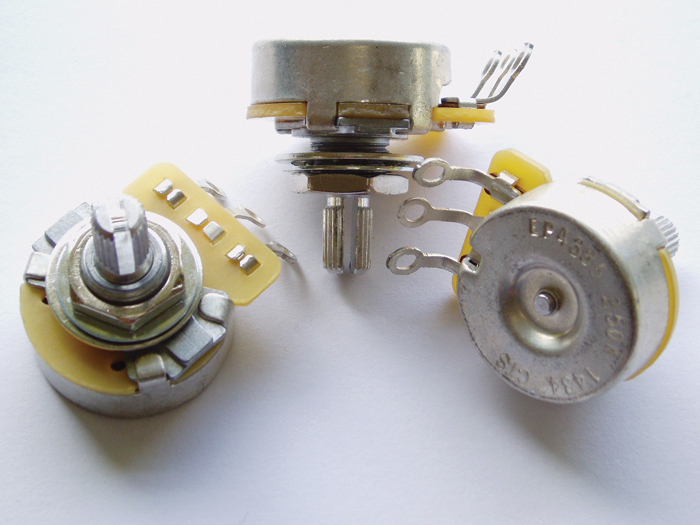 Whichever potentiometers you choose, it is essential that they have split shafts for Strat-style push-on knobs. 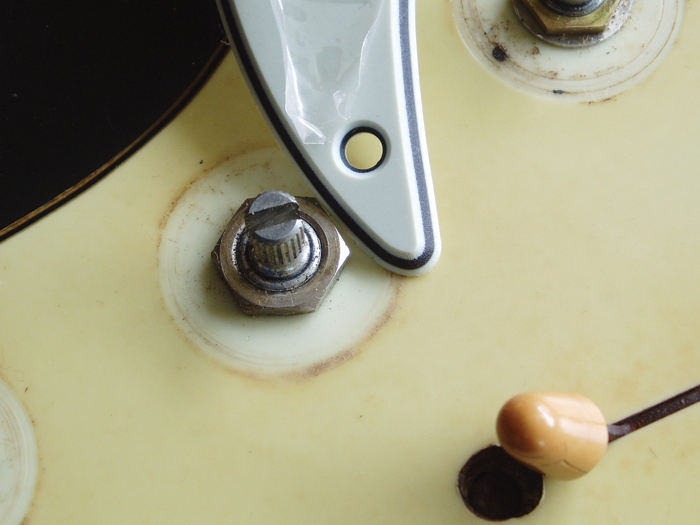 Strats and Les Pauls have control knobs that push onto the potentiometer shafts, so you’ll need split-shaft pots. 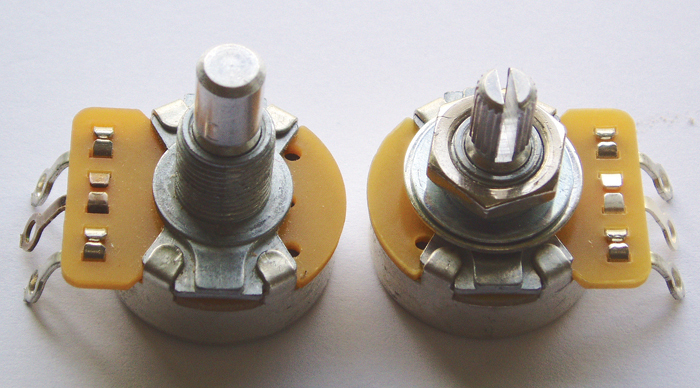 Solid-shaft potentiometers are used for control knobs with grub screws, like the ones used on Telecasters. You can see a solid shaft on the left and a split shaft on the right. If you use your pickup selector a lot, it seems unwise to compromise on quality. The CRL and Oak Grigsby switches work well and are reasonably faithful to vintage originals. Unfortunately, the securing screws won’t look quite right, but we’ll come back to that later. This CTS five-way switch is perfect for our project. It lines up with the screw holes of USA spec pickguards and the connection lugs correspond to most of the wiring schematics you’ll find online. Lastly, you’ll need to choose a tone capacitor. Reproductions of the early-style ‘phone book’ types are available from various suppliers, such as Allparts and Northwest Guitars. They certainly look the part, but they are very expensive and underneath the wax and paper wrapping they’re just modern-style film capacitors. A ceramic ‘dime’-style capacitor will be cheaper and completely authentic – especially for early-60s replicas, and Northwest Guitars sells those, too. Ceramic capacitors can be microphonic, too, which adds a certain something to the high-frequency response. If tone is more important to you than aesthetics, some popular alternatives include silver mica, Mallory 150s, Sprague Orange Drops, Vitamin Qs and Russian K40Y or K42Y paper in oil (PIO). Pre-CBS Strats had 0.1uF (100nF) capacitors, and the value is important if you want authentic 60s tone. Here, we see a couple of ceramic discs, a modern film capacitor from Vishay and a couple of Russian paper/oil types. For the first decade of production, Fender installed 0.1uF capacitors in Stratocasters. Around 1964, the cap value was changed to 0.047uF and this is significant because some treble is always lost through tone circuits – even when they’re supposedly off. Strats with 0.047uF caps will sound slightly brighter than those with 0.1uF – due partly to the higher roll-off frequency, but more importantly because the resonance peak around the roll-off occurs higher in the audio spectrum. This is an original ‘phonebook’-style capacitor in an unmolested ’56 Strat. You can buy amazing looking replicas, but inside they are just modern film types, rather than paper/wax. 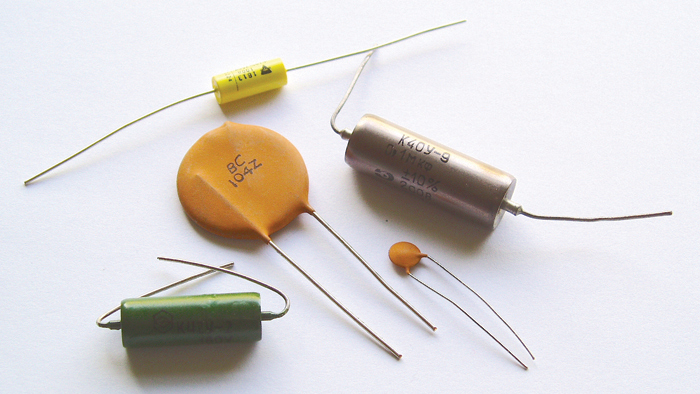 It’s simple enough to hook up an AB switch, or even a rotary switch, to compare capacitors. Most electronics engineers will probably tell you that all caps of the same value should sound the same. In contrast, most guitarists who have taken the time to compare tone caps will probably tell you the opposite. Finding out for yourself can be a lot of fun, and even if you end up spending £10 on a tone capacitor, that’s still considerably cheaper than buying a set of hand-wound pickups. All of this brings us neatly around to choosing a set of pickups. 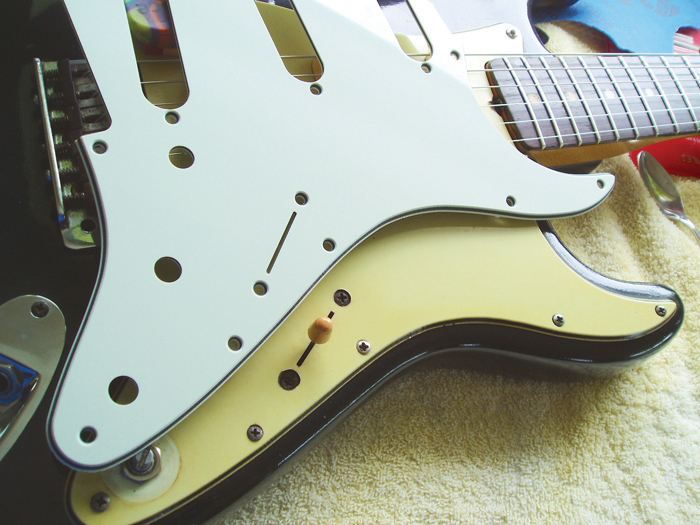 Although pots, caps and shields all play their part in this complex sonic equation, pickups remain the most important factor. We’ll save pickup comparisons for another time, but there are some key features you should look out for if you want a set of pickups that will deliver convincing vintage tone. It’s obvious that vintage-correct materials and construction methods increase the likelihood that a set of replica pickups will sound ‘right’. The originals were made with hand-bevelled and staggered Alnico V slugs, and for 60s-style Strat pickups most modern winders tend to favour weakened Alnico Vs. Some alternatives include the naturally weaker Alnico IV and Alnico III alloys. Formvar magnet wire is another period feature. It was coated with an insulating layer of polyvinyl formal varnish (hence ‘formvar’), and when two coats were applied rather than one, it was known as ‘heavy formvar’. During the mid-60s, Fender began using plain enamel magnet wire rather than formvar and most guitarists agree that they sound different. They look different, too – the formvar’s coppery red contrasting with the purple hue of plain enamel. The late-60s style pickup on the right has plain enamel magnet wire. Compare this with the copper-coloured formvar wire on the early-60s style pickup to its left. Of course, there are other factors at play, but the consensus seems to be that formvar has more harmonic overtones, with extra highs and lows, scooped mids and a generally woodier sound. It is also important that the coil should be ‘scatter wound’ to a DC resistance somewhere between 5.9K and 6.2K. The idea that players such as Stevie Ray Vaughan used overwound pickups is probably a hangover from some misleading pickup advertising during the 1980s and based more on fantasy than fact. Consequently, vintage tone fans should be sceptical of any set of ‘vintage-style’ pickups if the description of them contains words such as ‘hot’, ‘barbecue’ or ‘Texas’. They may sound fantastic in their own right, but they’re unlikely to sound like early-60s pickups. Lastly, it’s worth considering that vintage sets did not have calibrated windings. Most were wound to more or less the same DC resistance, installed randomly then the height adjustment screws were used to balance them up. Invariably, the bridge will end up closest to the strings and the neck unit will be some distance away. Personally, I prefer non-calibrated sets because once properly set up, each pickup will have a more distinctive tone. a single theme as a result. The proximity of the magnetic slugs to the strings also inhibits vibration, which can make the guitar sound out of tune in the upper registers and reduce sustain. Since two of the pickups on a non-calibrated set will end up some distance from the strings, there’s less magnetic pull and the guitar will resonate more freely. 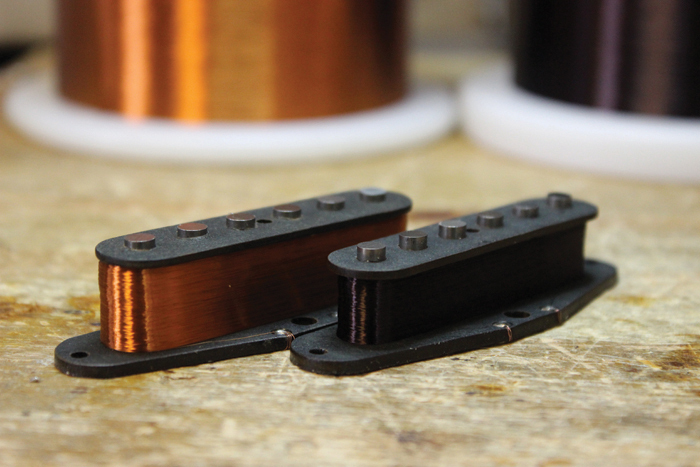 There are hundreds of boutique pickup winders out there, all claiming to make the most authentic replicas available. For this feature, Monty’s Guitars very kindly supplied us with a ’62 set, and I’d would have to say that they are among the best early-60s style pickups I’ve tried. 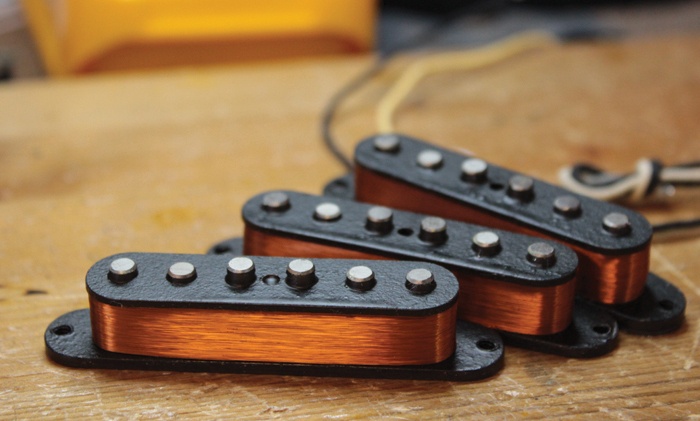 This set of ’62 replica pickups from Monty’s Guitars was hand-wound here in the UK. They tick all the right boxes, with hand-bevelled Alnico slugs, formvar magnet wire, scattered windings and, most importantly, distinctive tone. All these pickup specs can be confusing, but knowing about the key constituents will help you to make more informed choices when you decide it’s time to upgrade. Well, that’s all of the necessary theory covered, the shopping list has been written and it’s time to apply a bit of ageing before loading up the pickguard and hooking everything up. Check out the next instalment of our DIY Workshop to see how it all turns out.